On Oct. 17 of last year, Erin Henderson was one of two Jets players with a team-high seven tackles in a loss to the Cardinals. It was the second straight game Henderson led New York in tackles. 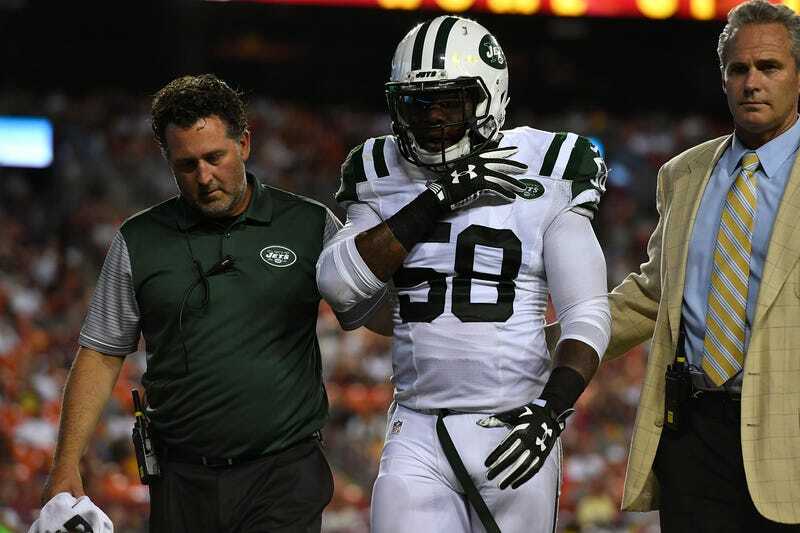 Five days later, the Jets placed him on the non-football injury list, effectively ending his season. In February, they chose not to exercise his contract option, effectively ending his NFL career. On its face, Henderson’s plight is a common one, according to the unforgiving logic of the NFL’s roster churn. But in a lawsuit recently filed in New Jersey Superior Court, Henderson alleges the Jets discriminated against him because of his bipolar disorder, for which the team had prescribed a medication that, according to what his agent told ESPN, led to adverse side effects that the Jets then used against him. The suit, which accuses the Jets of wrongful termination, could wind up testing the way the NFL treats players with mental health problems. According to what Henderson’s agent, Jim Chapman, told NJ.com, the Jets never provided a reason for why Henderson was placed on the NFI list. Chapman subsequently informed ESPN it was only later, after two postponements, that general manager Mike Maccagnan and another team executive told Henderson it was because Henderson had missed several meetings early in the 2016 season. But the lawsuit alleges that the Jets had prescribed Henderson with Seroquel to treat his bipolar disorder. Chapman told ESPN and NJ.com the Seroquel had made Henderson so sleepy it could be difficult for Henderson to wake up in the morning, and that Henderson had communicated this problem to team officials. Henderson began the 2015 season in a backup and special teams role but eventually earned enough playing time to platoon at MO linebacker. The Jets elected to re-sign him the following spring, and he entered 2016 as a starter at age 30. In September of last year, I wrote a story for Vice about how his was the league’s best comeback story. After playing in five of the Jets’ first six games, including four starts, Henderson was suddenly placed on NFI. Chapman told NJ.com Henderson had never failed a drug test, nor had he gotten into any kind of trouble with alcohol. Henderson did sometimes go to a hotel bar near the Jets’ facility in Florham Park, N.J., but Chapman insisted to NJ.com it was to pick up food, not to drink. Chapman said defensive coaches and teammates regularly berated Henderson for “being hungover” and “still drunk” when he showed up. No team personnel ever checked Henderson for possible side effects of the medication, Chapman said. When the 2016 season ended, the Jets cut off Henderson’s medication and did not refer him to another doctor, Chapman said. Chapman also told ESPN some Jets defensive coaches would go drinking with players, a practice they called “Thirsty Thursdays.” The lawsuit alleges that all of this contributed to a hostile work environment. Henderson’s Jets contract was a big bet on himself. It was for one year, at a base salary in 2016 of $885,000, plus $365,000 in bonuses. But it also had a $2.25 million team option for 2017, in addition to up to $500,000 in bonuses. The lawsuit accuses the Jets of using the NFI as a pretext for violating the New Jersey Law Against Discrimination, which is more sweeping than the federal Americans With Disabilities Act and Title VII of the Civil Rights Act. The suit also says the NFI designation came days before the Jets were obligated to pay Henderson a $250,000 bonus, and that the Jets had used it to avoid paying Henderson more than $580,000 of his remaining 2016 salary. Henderson’s lawyer, Larry Lavigne, told me the Jets were not forthcoming after Henderson filed a grievance through the players’ union. NJ.com quoted Chapman as saying the Jets told Henderson at a grievance hearing in June that he was “not fit” to play football. Henderson is now working as a substitute eighth-grade math teacher and as a volunteer assistant varsity football coach at his high school alma mater in Aberdeen, Md. His wife and son live across the country in Los Angeles, while Henderson is living with his father.